In contemporary life, the marketplace has emerged as an important arena for the practice of politics. Concerns about personal and family well-being as well as ethical or political assessment of favorable and unfavorable business and government practices become part and parcel of the marketplace of politics. This volume describes this phenomenon as political consumerism, reflecting an understanding of politics as a product embedded in a complex social and normative context. 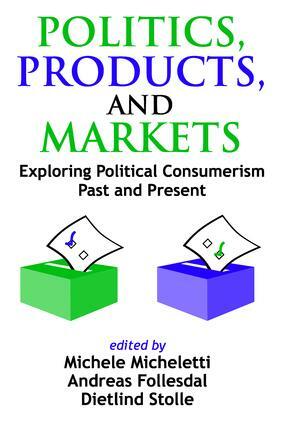 Politics, Products, and Markets is the first general study of political consumerism. It asks fundamental questions, including what is new and what is old about the phenomenon. The authors discuss the mediating role of political consumerism in the problematic relationship between markets and morality. They explore whether institutional arrangements have been developed to permit consumers and producers to assume ethical responsibility for their choices and behavior. They ask why political consumerism is presently on the rise. And they investigate the relationship between globalization and political consumerism. Part 1, "Making Money Morally," discusses how political consumerism challenges the perceived division between private interests pursued by private actors in the market and public interests pursued through political means. Part 2, "Consumer Choices and Setting of the Agenda of Politics," contains examples of how political consumerism sets the agenda of politics and discusses its democratic quality. Part 3, "Building Responsible Institutions in Multi-Risk Society," has as its central theme the development of new political consumer institutions. Part 4, "Politicizing Consumers and Change in Politics," studies the characteristics of political consumers and raises the question of whether political consumerism really is politics. This volume will be of interest to social scientists, social activists, and policy institutes.